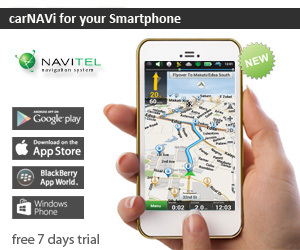 Use this tool to backup or restore your carNAVi’s system settings, waypoints, history information, recorded tracks and saved routes. This windows tool allows to create backups of the settings or the complete navigation system and archive them on your PC. A comfortable restore function is also included as well as restorable default settings. Download the installer from the software download section or use the link below and save the downloaded file on your local computer, for example on your Desktop. After downloading double click the installer and follow the instructions. If the installation is finished, you will find a new program group ‘carNAVi Backup’ in your startmenu programs. There you have two icons for creating a full backup or a settings backup. 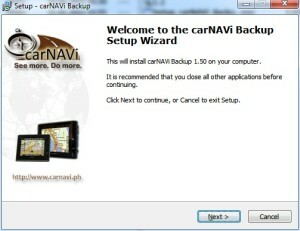 To start a backup, please switch on your carNAVi first and while the main menu is showing, connect it to a free USB port of your computer and tap on the PC connection icon (right one) on the navi screen. We also included a set of default settings for the different carNAVi models. If you like to restore these default settings, simply open them and restore as explained above. Your waypoints and histroy will remain, they will not be deleted from the unit.